NEW BRITAIN - The CIAC released the brackets for the girls basketball tournaments on Wednesday and six New Britain area teams will be participating. Berlin, Newington, Southington, Plainville, Innovation and Goodwin Tech each qualified across Class LL, M and S and now, each team's potential path through the state tournament is clear. There are two teams going through Class LL. 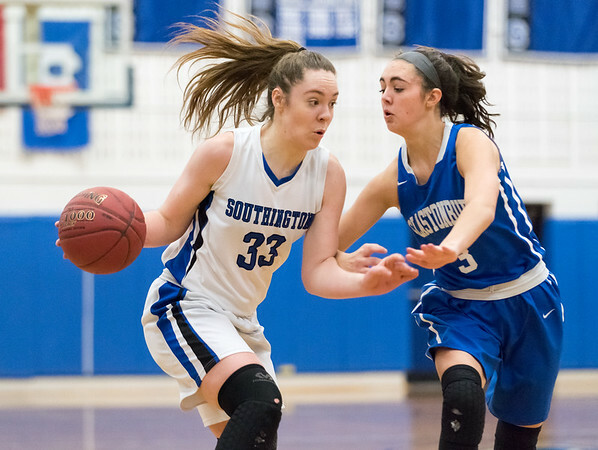 Southington is the area team that finished the regular season with the best record at 15-5. The Blue Knights, who earned the 13th seed, will open tournament play at home against No. 20 Glastonbury (11-9) Monday at 7 p.m. If Southington beats the Tomahawks, it’ll play the winner of No. 4 Simsbury (18-2)/No. 29 New Milford (9-11) on March 1. Newington also made it to the Class LL tournament bracket. The Indians finished their regular season 9-11, earning the 27th seed. Newington will face the 6th-seeded Newtown (17-3) at Newtown on Monday at 7 p.m. If the Indians were to beat the Nighthawks, they would then faceoff against the winner of No. 11 Hamden (16-4)/No. 22 Conard (11-9) on March 1. In Class M, Berlin finished its season 12-8, claiming the 19th seed. The Redcoats won nine out of their last 10 games in the regular season. The first opponent for Berlin will be Stonington, on Monday at 7 p.m. in Stonington. The Bears finished the season 13-6, which was good enough to earn the No. 14 seed. If Berlin beats Stonington, then the Redcoats will continue to play the winner of the third-seeded St. Paul (17-3)/No. 30 Oxford (9-11) game. The other team representing Class M is Plainville. The Blue Devils finished their season 11-9, earning the No. 24 spot. Plainville will open tournament play at Weston Monday evening at 7 p.m. The Trojans finished their season 15-5, earning the No. 9 seed. If the Blue Devils were to beat Weston, they would see the winner of No. 8 Granby (15-5)/No. 25 Morgan (10-10) in the second round. The final two teams representing the New Britain area are Innovation and Goodwin Tech, both in Class S.
The Gladiators, who finished the regular season 8-12 earned the 32nd seed and will open up tournament play against No. 1-seed Parish Hill (18-2) Monday night at 6 p.m. in Chaplin. If Goodwin Tech were to pull off the upset in the first round, it will take on the winner of the No. 16 Portland (11-9)/No. 17 Wamogo (11-9) on the road on March 2. As for the Ravens, they finished their season 8-11, earning the 28th seed. Innovation will travel to East Hampton, Monday at 6 p.m. The Bellringers finished their season 15-5 to earn the fifth seed. If the Ravens were to beat East Hampton, they would face off against the winner of the No. 12 Cheney Tech (14-6)/No. 21 Windham (10-10). The only team to not make the state bracket was New Britain. The Class LL Hurricanes finished their season 5-15. Posted in New Britain Herald, Berlin, Goodwin Tech, Innovation, New Britain, Newington, Plainville, Southington on Thursday, 22 February 2018 22:45. Updated: Thursday, 22 February 2018 22:48.